Are you building a new property that requires indoor fencing? Perhaps you’re looking for a quality indoor fencing contractor to replace the indoor fencing you already have. Whatever the case may be, if you’re in the market for a trusted and reliable indoor fence company in Minnesota, you’ve found us. At Twin Cities Fence, we make our clients’ satisfaction our number one priority – right next to ensuring the quality of our fencing systems and services. No matter what type of indoor fencing you’re looking for, we’ve got you covered, installing, repairing and replacing a wide range of fencing materials and indoor fencing types on commercial, residential, and municipal properties. Are you operating a sports facility that requires indoor fencing for courts and fields? Perhaps you run a business that includes sports fields or courts. Or maybe you even have indoor sports courts in your home that need fencing! Whatever type of indoor sports fencing you require, whether it be for a hotel, sporting facility, business, or home, we’re here to make sure your sports courts are safe, secure, and even aesthetically pleasing by offering you a selection of indoor sports court fencing materials. If you have a gymnasium that’s less secure than you’d like or need, a gymnasium fencing system can go a long way toward make your property safer. With an indoor gymnasium fence, you can make sure your gymnasium is only accessible when you want it open and to those who are given access. Want to keep an indoor swimming pool fenced off without building an entirely new room indoors for your pool? Perhaps you just want an extra level of security surrounding your indoor swimming pool. Whatever the case, a swimming pool fence will help you keep your pool and everyone on your property safe. Is your hotel a little different, offering indoor courtyards open to guests? If you want to keep areas like courtyards secluded for guests and away from the public, what better way to do so than with a decorative fencing system that keeps guests safe and private spaces private? For veterinary offices, kennels, and other dog or animal control facilities, indoor fencing can be useful as a means of providing security for staff, clients, and animals, keeping all animals safely contained in fenced-in areas that can be as accessible or inaccessible as you need. 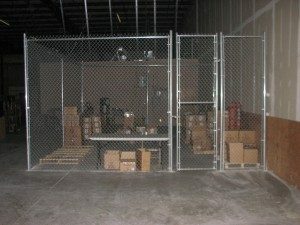 Want a way to keep your storage facility or warehouse organized, more secure, and safer? An indoor warehouse fence could be just what you need. Factories can be dangerous spaces, especially if you’re running a factory that has restricted areas or employee-only access points. To keep these areas secure without building around them, simply install a security fence! So which type of indoor fencing material is right for your needs? At Twin Cities Fence, we install several indoor fencing materials, perfect for different uses depending on your needs. Wood Fences: Choose from wood post and rail fences, wood privacy fences, steel post wooden fences, and picket fences. Vinyl Fences: We install vinyl privacy fencing, vinyl post and rail fences, and vinyl picket fences, which can be made to be more decorative. Chain Link Fencing: Choose from our regular galvanized steel chain link fencing and our colored, PVC coated chain link fences. Aluminum Fences: If you’re looking for a modern fencing system that’s also extremely secure, durable, and affordable, aluminum ornamental fencing might be what you need. Often used inside hotels, aluminum fencing can be made to match outdoor fencing or cordon off areas like pools or sports facilities that are guest or employee-access only. Steel Fencing: Just like aluminum fencing, indoor steel fences give a modern feel with great security! Trex Fencing: Trex fencing is our eco-friendly fencing. It’s low-maintenance and durable and has the look of wood and vinyl combined. Choose from our three color options: Saddle, Winchester Grey, and Woodland Brown. Offering municipal, residential, and commercial indoor fencing installation and repairs, we’re the place you go when you’re in need of quality indoor fencing systems, whether you’re a big corporation, a small business, a school, or a homeowner. To find your perfect indoor fencing system today, contact Twin Cities Fence Minnesota indoor fencing contractors today at 612-443-1948.